An excellent biography of John Haygarth, an important 18th-century physician who is most well known for his visionary plan to eliminate smallpox from Great Britain through the careful practice of inoculation & isolation. 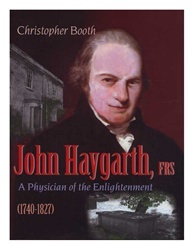 Haygarth made many more innovative & far-reaching contributions to medicine & to philanthropy. He became a physician in Chester in 1767. There he introduced separate wards in the Chester Infirmary where patients with fever could be isolated & cared for. It was the stimulus for the development of the fever hospitals of 19th cent. England. He also played a major role in the foundation of the Bath Provident Institution for savings, a model for the savings-bank movement in England. Black & white illustrations.